Mercedes have revealed the new car, the W10, ahead of the F1 2019 season as they bid to maintain their long reign as the sport's dominant power. 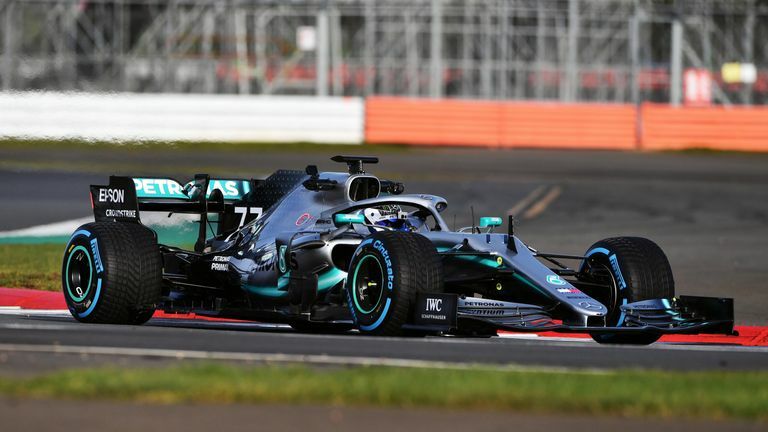 The W10 was given an immediate on-track debut, with Bottas behind the wheel of the new Silver Arrows on Wednesday morning during a 'shakedown' run at Silverstone. Lewis Hamilton, the reigning drivers' champion, begins a new two-year contract at the team as he aims to become just the second driver in history to win six world titles. "2018 was a great year, but I feel like 2019 can be even better. I want to achieve more, I want to continue to keep pushing. I feel energised and I'm ready to attack," said Hamilton. "The buzz really starts at the beginning of the year when you see the car coming together. And then you get to the shakedown and you get into the car - it just never gets old." "I'm going to go all in this year," said Bottas. "There was quite a bit of criticism at some stages of 2018, but that's actually been a positive thing for me because it's given me an extra boost!" Hamilton delivered all of Mercedes' 11 race victories last year, with the 34-year-old credited with making the difference in the team's title fight with Ferrari. "We have to start from scratch, we need to prove ourselves again," said team boss Toto Wolff. "There's absolutely no feeling of entitlement to be at the front. In fact, with the regulation change for the new season, every team can have a shot at the title and we're seeing all of them as a potential threat." "Lewis spent some time travelling," said Wolff. "When we met after the winter break, he was refreshed; he's extremely hungry and wants to start racing again." "He has been able to fully reset after a season that was not always easy for him. Valtteri knows he has the full backing of the team to succeed and he's excited to get back in the car and show his critics what he can do," said Wolff. "I'm really looking forward to a strong competition between the two of them, racing each other hard and fighting hard against our rivals." What do we know about the W10? Mercedes began work on their new car at the end of 2017 and technical chief James Allison has indicated the team's focus was on eradicating some of the flaws of last year's tyre-hungry W09 without losing any of its strength. "The handling of the W09 was a big improvement over the rather idiosyncratic W08. We managed to be competitive at tracks which had plagued us in recent years. However, we were still not as good as some of our competitors at preserving the performance of the rear tyres," said Allison. "We have worked hard on the suspension and aerodynamic characteristics to deliver a car that will be much kinder to its tyres." Allison added that although the W10 has kept the same wheelbase length of the W09 and "the general architecture as its forebears", close scrutiny of the new car would "reveal that the execution of this concept has been further refined - every item pushed tighter, made more slender - each change permitting us to improve the aerodynamic performance beyond what would have been possible had we accepted the physical limitations of the 2018 design." Live television coverage on Sky Sports F1 of the first pre-season test at Barcelona will begin on Monday February 18 at 1pm and will continue until 6pm. Sky F1 will also be broadcasting live coverage on Tuesday February 19, Wednesday February 20 and Thursday February 21 between 1pm and 6pm. Our live review show, Welcome to F1 2019, will begin at approximately 5pm on every night of the test. Selected highlights from the day's broadcast will be available on Sky Go, On Demand and the Sky Sports digital products. What's changing on the 2019 cars? Regular updates from Barcelona will be published on our social accounts, while Craig Slater will be delivering live reports from the Circuit de Catalunya for Sky Sports News.